The Stars scored first, then the Blues reeled off six unanswered goals, with 12 different players recording points. 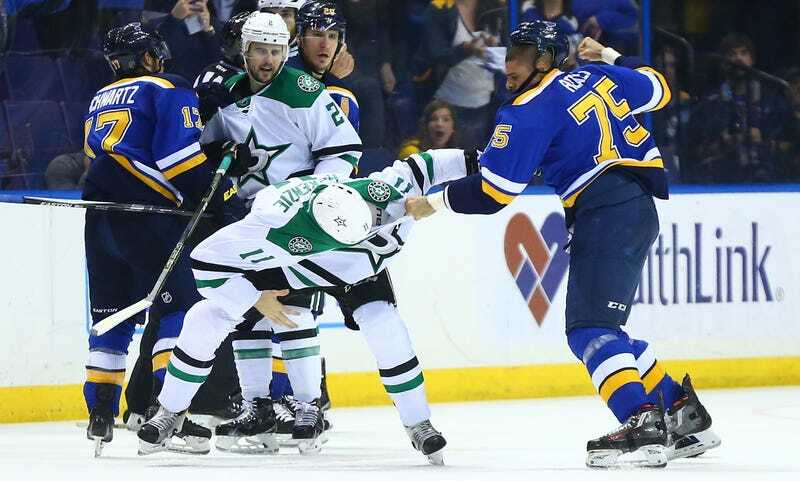 It was a laugher by the time Stephen Johns boarded Alex Pietrangelo, which somehow ended up with Ryan Reaves and Curtis McKenzie (briefly) trading blows. Look at Reaves’s swagger as he disengages from McKenzie. He feels good! The Blues feel good, after just their second playoff game (and their first win) that wasn’t decided by one goal. They’ve got the 2-1 series lead on the Stars, it feels like everyone’s scoring, Dallas’s goaltending situation is still unsettled, and Kris Russell got totally pantsed. Everything’s coming up St. Louis! Blues fans are understandably curled into quivering balls of anxiety at the slightest whiff of optimism.